The Basketball Arbitral Tribunal’s policy on publishing written reasons – does it strike the right balance between speed & legal certainty? On March 8, the first ever User Conference of the Basketball Arbitral Tribunal (BAT) was hosted in Munich, Germany. Wouter Janssens, founding partner at international boutique sports law firm CRESTA, participated in a round table discussion to tackle several topics from over a decade of BAT practice. One of the key subjects discussed was the BAT’s policy on publishing written reasons when issuing awards. It’s an important matter to consider as written reasons can help to explain the Arbitrator’s thinking, allowing legal practitioners to analyse awards, deduce the general legal principles applied by the Arbitrator, and comprehend the decision in the context of underlying jurisprudence. On the other hand, written reasons imply higher arbitration costs (on average € 3,930 - three thousand, nine hundred and thirty Euros - for awards without, versus € 8,963 for awards with written reasons) and an extended duration of the proceedings1. Subject to Article 16.2, the Arbitrator shall give a written, dated and signed award with reasons. Before signing the award the Arbitrator shall transmit a draft to the BAT President who may make suggestions as to the form of the award and, without affecting the Arbitrator's liberty of decision, may also draw his/her attention to points of substance…. the dictum (operative part) of the award. An example of such an award can be viewed here3. An example of such an award can be viewed here4. The determination of the value of the case is straightforward, as nearly all BAT cases are monetary claims. In other cases, the value shall be determined by the President of the BAT (Article 17.1 of the BAT Rules). In any event, for a claim to be brought before the BAT, it must have a pecuniary aspect (i.e. be relating to money – see Article 177(1) of the Swiss Private International Law Act - PILA). On receiving an award without reasons, each party has 10 days to file a “Request for Reasons” with the BAT, subject to the payment of an additional advance on arbitration costs, which in the author’s experience consistently amounts to € 5,000.
the value of the dispute is (by definition) likely to be limited, meaning the costs of an appeal are likely to be disproportionately high. Two elements that could jeopardize the availability of awards, and thus also of written reasons, are confidentiality and the publication rate. However, BAT awards in principle are non-confidential, unless ordered otherwise by the Arbitrator or the President per Article 16.4 of the BAT Rules. Besides, the publication rate for non-confidential BAT awards is nearly 100%. Since May 2014, nearly all awards with reasons pertain to cases with a value over € 100,000. The value of the dispute, however, is not always an indication of the jurisprudential importance of a case. For example, cases relating to the recovery of €500,000 in undisputed overdue payables can be relatively straightforward (and probably do not require written reasons). On the other hand, disputes between players and agents or disputes regarding contract termination — which in the author’s experience usually do not reach the current €100,000 threshold (or even the former €30,000 threshold) — can often prove to be more complex and involve important points of law and principle. In this light, the ratio of awards with relevant written reasons (i.e. contributing important points to the overall body of jurisprudence) is considerably lower than the abovementioned percentages. 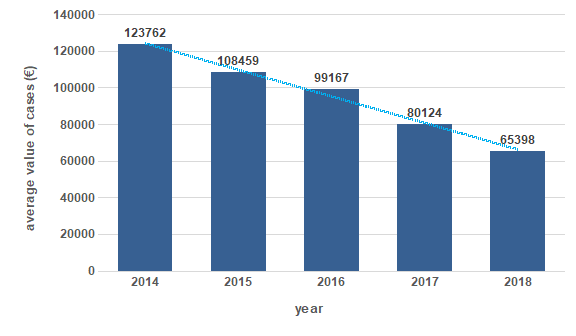 In the author’s view, this trend needs to be given consideration because limiting the absolute number of awards with written reasons could in turn could jeopardize the predictability of the outcome of BAT disputes (i.e. the certainty and consistency). It is to be noted, however, that the BAT in any event remains the best possible solution for the efficient and effective resolution of disputes in professional basketball, benefiting also from the enforcement via FIBA Secretary General (Article 3-335 of the FIBA Internal Regulations). 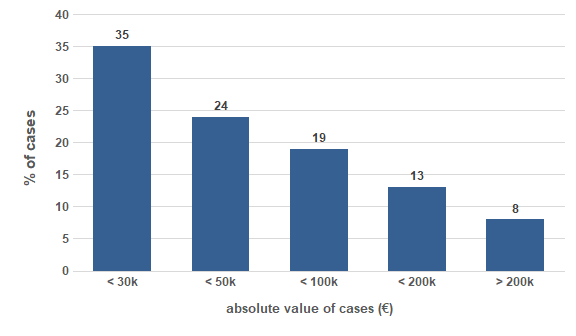 Considering the trade-off between lower costs (which facilities greater access to justice) versus more written reasons (which facilitates greater perceived justice and certainty), the current "minimum level" at €100,000 seems reasonable. As a sounder solution, the author has suggested that the BAT consider the option that awards that are currently rendered without reasons be joined with limited reasons in the form of a bullet-point overview of the Arbitrator’s relevant legal considerations. Ideally, this could be done in an applied manner for each award. Alternatively, it could be done in an anonymised manner by providing an overview of the general legal considerations deduced from a set of BAT awards, for example each time they are being published. The financing of such limited reasons could be done via cross-subsidization by no longer rendering full reasons for high value cases that are clear on the merits. In case the rendering of limited reasons would be made optional to the parties, the related costs should be minor in order to not constitute a deterrent to file a Request for Limited Reasons. As such, the abovementioned trade-off could be avoided, and legal practitioners would be able to duly advise clients both proactively to adapt their commercial and contractual behaviour and reactively when facing disputes. 2 Copies of the BAT’s awards are available to view here: https://www.fiba.basketball/bat/awards (last accessed 29 March 2019). 3 Mr. Vlad Sorin Moldoveanu and Tangram Sports Ltd v. Büyükçekmeke Basketbol Kulübü, BAT 1211/18, 7 December 2018 https://www.fiba.basketball/en/Module/85132837-66aa-4ff3-a063-8cdfe44ea14d/50ec9115-fbca-4625-bc3b-1c4d0782f40a (last accessed 29 March 2019). 4 Mr. Blake Schilb v. Galatasaray Spor Kulübü Dernegi, BAT 1197/18, 28 December 2018 https://www.fiba.basketball/en/Module/85132837-66aa-4ff3-a063-8cdfe44ea14d/993a0ec1-91c7-4d60-8cd4-acd2018ceb58 (last accessed 29 March 2019). 5 See Footnote 1, above. 6 See Footnote 1, above. Wouter is a founding partner at CRESTA, international boutique sports law firm based in Brussels (www.crestafirm.com). Sports lawyer representing players, agents, clubs, leagues and investors on contractual, contentious (FIFA, FIBA, FIVB, CAS, BCAS) and regulatory matters. Attorney-at-law at the Brussels Bar and Assistant Professor of Law at the University of Leuven.